Welcome to Episode 145 of the Marketing for Owners Podcast. 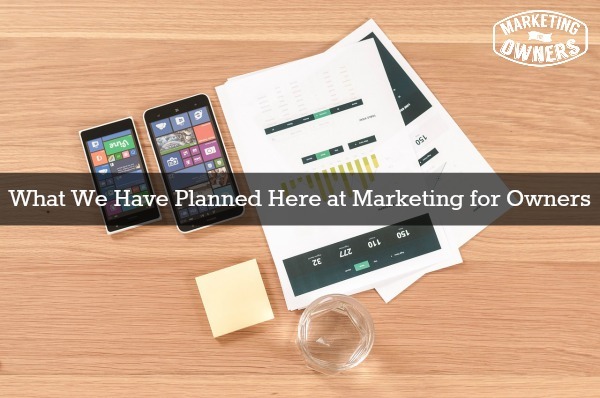 This is the place where I give you short, bite sized usable marketing tips or things that can help you in your business because they works for others, and they work for us! If you want to get real value (meaning it’s free and doesn’t cost anything) then go and download our 71 Marketing Tools ebook. If you are in the USA, you can text 33444 and enter the word 71TOOLS. Then you will get a text to have the email sent to your inbox. This is how I get everything done effectively and efficiently here at Marketing for Owners. The cool thing is that we don’t have any sales people. Now — back to the podcast. Every now and then, I like to update you with what we are doing here and what we have going on, and what we have coming so that you know exactly how we get ALL of this stuff done without a full time staff. I don’t like to work a lot of hours, and neither do my team. I have an amazing group of people that know exactly what they are doing, which makes it easily for all us to work just part time here at Marketing for Owners. So — what have we got coming? We are working on our training course called Website 101. In the perpetual sales cycle (my system for doing all this stuff), there are the 6 P’s of Modern Marketing. Presence: Now to have a presence, you need a website. Not only do you need the website, but you need it to be seen in a particular manner to make this stuff work. It really is very simple. You don’t need to pay anyone to create it for you. You can put this together all on your own for less than $100 (see my post by clicking here to learn more about how to do that). We have a Facebook course coming up soon. We are running an experiment right now with ads and such and it seems to be doing quite well. We are going to show you how we’ve done it so you know what steps to take to make your facebook grow. We don’t use Facebook to build up Facebook, we use it to drive people to our website. In this course, we are going to show you how to use Facebook to increase the traffic on your own site – and not give all the glory to Mark Zuckerberg. Then we have books. Every Monday on the podcast, I recommend a book and it has become quite a large resource. We are going to put that list together so that you can find all of our recommended titles in one place. Claire is working on checklists as we speak. She is also working on cheat sheets and reports. We are hoping that every single post on the blog will have a simple summary sheet or “Cheat Sheet” of sorts. All members of the Owners Club will get to access ALL of this for free. (You can sign up here — it’s free). We are building reports like the 71 Tools that many of you have downloaded. All of these types of resources will be free on the blog. We are putting together a list of blogs we like. This list of blogs will encourage you to look at others who are doing this effectively and learn something from what they are doing. I love listening to Podcasts and on Thursday, I share what I am listening to that week. The list keeps growing, so why not put it out there for you to grab one and listen too. We are running a little experiment on something that will make SEO a simple little side once you add it to your content. There is nothing complicated with this — no exams to take or no courses to take. We are going to run it and explain how that works. There are other bits and pieces that we are going to do like a monthly infographic type of thing, and a listical type post — that sort of thing. Grab Your Pen and Paper and Write This Down: What are you going to do? Is it going to be a report, an ebook, an update, a new channel, a test. 1. 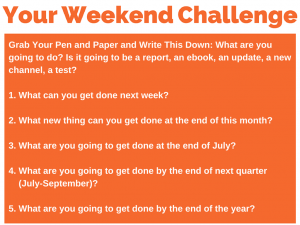 What Can You Get Done Next Week? 2. What new thing can you get done at the end of this month? 3. What are you going to get done at the end of July? 4. What are you going to get done by next quarter (July-September)? — This one will be longer because it is a 3 month span. 5. What are you going to get done by the end of the year? The idea is to get something done. Once you start doing this, you will be able to do this every quarter. Set yourself challenges and continually advance. 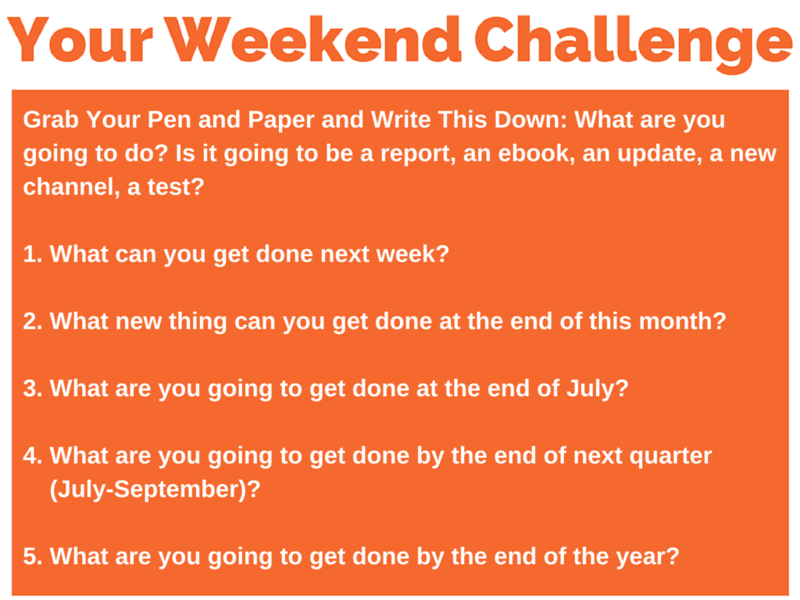 Have a great weekend doing your challenge and I will be back on Monday with some more exciting things to report.